Scientists develop puffer fish pills for effective treatment delivery : Healthcare Asia Daily News | Asia's Leading News and Information Source on Healthcare and Medical Industry, Medical Technology, Healthcare Business and R&D, Healthcare Events. Online since 2010. A puffer fish or blowfish naturally inflates to inedible sizes when threatened, filling up with water or air to evade predators. 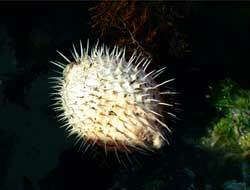 Certain species even have spines projecting outwards to make them less palatable. The concept is applied to create a similar soft, jelly-like pill designed from absorbent hydrogel particles with an inner protective membrane. The pill quickly expands in the stomach and can be passed safely out of the body upon drinking a solution of calcium that makes it shrink again. The scientists from Massachusetts Institute of Technology (MIT) have said that the squishy pill was strong enough to withstand stomach contractions and lasts a month compared to current hard plastic or metal alternatives. In a study to test the pills’ efficiency, temperature sensors inside pills were fed to pigs – which have very similar stomachs and intestines to humans –and their daily activities were recorded for up to 30 days. The researchers hope to use different sensors inside the puffer pills to monitor unwanted bacteria or viruses in the stomach. There is potential to check the progress of tumours or ulcers with tiny cameras inside the pills. Xuanhe Zhao, associate professor of mechanical engineering at MIT has said that a “smart pill” to monitor the stomach is ideal.While not yet tested in humans, Prof Zhao said the pill could also provide another option to the gastric balloon, used to encourage weight loss.